Karishmaa (lit. Miracle) is a 1984 Hindi language film starring Kamal Haasan, Reena Roy, Tina Munim, Danny Denzongpa with Jagdeep, Sarika, Raza Murad, Viju Khote, Mac Mohan, Swaroop Sampat, Satyendra Kapoor, Mahesh Anand, and Baby Pinky. 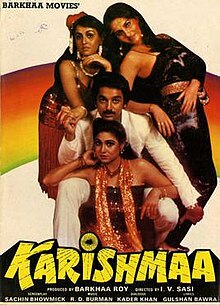 In this film Kamal Haasan plays the role of a photographer, Danny Denzongpa plays the character of a notorious criminal and Reena Roy acts as Kamal Haasan character's girlfriend. It is a remake of P. Bharathiraja's Tamil film Tik Tik Tik (1981) that also starred Kamal Haasan in the same role. ^ Narayanan, Sujatha (25 October 2017). "IV Sasi made stars out of actors, without losing craft: A look back at some of his most notable work". Firstpost. Retrieved 2018-03-20.